This year’s AGM takes place on Tuesday 18 July. Join us for a site visit at 5,30pm, buffet+drinks at 6.30pm – with a talk on Herefordshire’s clean energy strategy and the AGM itself at 7.15pm. This year’s AGM will take place in the early evening of TUESDAY 18 JULY 2017, at the same venue as last year, the Lady Emily Hall, Tarrington – further information to follow in due course but please make a note in your diaries. We would love to see as many Pomona members and other interested local people as possible. We are pleased to announce that the installation of solar panels, including the additional 50kW added as a extension, are now all installed, commissioned and generating electricity. We would like to thank all our members who have bought shares that has enabled this project to happen. On the website you can see some aerial photographs of the panels in place. We have just reached our £70,000 target for the phase 2 share offer, thanks to everyone who has applied for shares. If you didn’t apply in time, there are several other community energy schemes that are trying to reach their targets before the 30th Nov when tax relief is withdrawn – have a look on www.sharenergy.coop/live/ for list of open share offers. Impending changes to EIS legislation has imposed an important deadline to our extension share offer. The government has just announced that EIS legislation will be changed so that community energy schemes will be excluded from this tax relief and this will be enacted from 30th November. If you want shares in Pomona and want to claim the tax relief you need to get an application in before this date. We have to process the application and clear cheques before issuing shares so APPLICATIONS MUST BE RECEIVED BY US NO LATER THAN 20TH NOVEMBER FOR APPLICATIONS ACCOMPANIED BY CHEQUES, OR 26TH NOVEMBER FOR EMAILED APPLICATIONS PAID BY BANK TRANSFER. The share offer will be continued after this date but shares would not be eligible for tax relief. This new legislation means that no community energy share offers after this date will be eligible for tax relief so THIS IS THE LAST CHANCE TO TAKE ADVANTAGE OF EIS TAX RELIEF WITH COMMUNITY ENERGY SHARES. 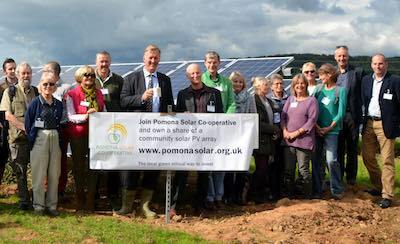 We are delighted to announce that Pomona Solar Cooperative has now committed to building an extra 50kW extension at Stoke Edith and has today launched a new share offer to raise the £70,000 needed to install the panels. Our planning permission allows us to build up to 300kW but we decided to build just 250kW in the first phase with the intention of adding 50kW at a later date. However, because of the threat that the Feed in Tariff will all but disappear in 2016, we have accelerated our plans and have decided to install the final 50kW before the end of the year so that we can still obtain the current tariff. You can download a share offer document and application form here. Pomona’s first 140 kW solar array was commissioned on 23rd June on time and on budget, a feather in the cap of any engineering project. The Pomona board are also delighted to announce that the array is now feeding power to Hereford Casks, a local company making casks for the independent brewing industry. Chris Strange, Owner of Hereford Casks says “The scheme will help our business, because we will be able to buy some of our electricity from the solar cooperative more cheaply than we buy it from the grid”. The Stoke Edith based, community energy project is building 250 kW of ground mounted solar PV. The scheme is on target to complete the final 3 sections, which will follow Western Power’s upgrade of the main grid transformer. This final phase will result in the supply of solar electricity to two more local businesses. The Pomona board are dedicated to supporting the local community and will be endowing a community fund using some of the scheme’s profit. This will provide approximately £1000 pa to be distributed to local good causes. Some profit will also go to shareholders in the form of interest, projected to average approximately 6% over 20 years, and repayment of share capital. As a co-operative, the scheme embodies all the international co-operative values of democracy, equality, community engagement, education and open membership. We are delighted to announce that at the AGM which was held on 16th July, two new directors were elected to the board of Pomona Solar Co-operative. The new directors are Jackie Jones and Rob Palgrave. It is very welcome to have fresh faces on the board at this exciting time for the coop as we are going through the final stages of the installation, with one array already commissioned and generating, and the remaining panels due to be commissioned as soon as the new HV transformer is installed on the site by Western Power Distribution.